It was here, on the banks of Tanunda Creek where bush turkeys once roamed, that pioneer Silesian settler Johann Friedrich August Fiedler planted the first Shiraz vines in 1843. His vines flourished and the land Section One, in the Hundred of Moorooroo was bought in 1865 by Gottlieb Ernst Schulz, a successful butcher who established a thriving retail business among the vines. Butchering developed into dairying, but the vineyards were always kept, until Peter, a fourth generation Schulz, and his wife, Christie, made the transition from grape growing to winemaking. 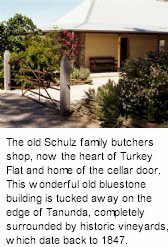 They transformed the historic bluestone butchers shop into the cellar door and heart of their Turkey Flat wine business, and made sure that the vines that Fiedler planted so long ago, now gnarled and twisted, are still a vital part of the process. And with good reason, for it is the intense, concentrated fruit from these ancient vines that set Turkey Flat wines apart and have made them sought after the world over. Turkey Flat is the local name for the vineyard property and is believed to be so named by the original settlers in the late1840s after the large flocks of native bush turkeys (Australian Bustard) in the area. Turkey Flat wines are made from four individual vineyard estates, all owned by Peter and Christie Schulz. The original Section One vineyard has the Shiraz, Grenache and small parcels of Mataro and Semillon. The highly regarded Cabernet Sauvignon is grown on the banks of the Bethany Creek in a small picturesque vineyard surrounded by ancient gum trees. Turkey Flat's Ros is made from the Menge Road estate Shiraz, Cabernet Sauvignon, Grenache and Dolcetto vines, all grown specifically for this purpose. The Butchers Block blend of Mataro, Shiraz and Grenache is sourced from the Stonewell estate. This vineyard is planted on a unique combination of red-brown earth soils (terra rosa) on a unique underlying limestone base. Stonewell is also planted to Marsanne. Most of the Turkey Flat vineyards survive only on natural rainfall, and where supplementary water is applied this is done so in very small amounts, and only to maintain healthy leaves and not to increase production. The vineyard yields vary from ten tonne/hectare at Ros to a mean two tonne/hectare for Shiraz. All of the Turkey Flat wines are made in the Bethany Road winery using traditional open fermenters. Barrel fermentation is followed by maturation in new and seasoned French oak hogsheads and barriques. Climate controlled barrel hall estate bottling further enhances the quality and delicacy of Turkey Flat wines.